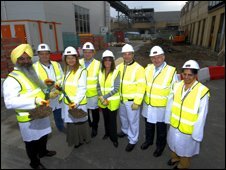 Construction has begun on a £5.2m research facility which will be used by Mars Chocolate in Slough. The town's mayor and mayoress of Slough and high sheriff of Berkshire visited the Dundee Road site to learn about the project. The modern, purpose-built centre will house all chocolate research and development activities. It will feature new offices, kitchens for preparing and creating products, and laboratories. A pilot line at the facility will enable products to be test-manufactured on a larger scale. A "zero-waste-to-landfill" commitment will be made on all building materials. Hoardings will be made of recycled plastic, which can be recycled later. Fiona Dawson, managing director of Mars Chocolate UK, said: "We're all very excited to be having a world class, state-of-the-art research and development facility built here in Slough." Are you buying Easter eggs?